How long does it take to barbecue chicken? Not long with these quick and easy steps. If using Jake's Gourmet Barbecue Chicken method, place round metal catch tray under the grill grating in the empty section away from the charcoal. The chicken will be placed above the catch tray while cooking. If using a beer can chicken recipe place holder inside chicken and place catch tray underneath holder. Lightly coat the chicken with Olive Oil then generously sprinkle Jake's Tri-Tip, Steak and Rib Rub Dry Seasoning all over the chicken. Press the rub into the skin of the chicken to ensure it holds on. Shake the seasoning into the cavity of the chicken to enhance the inner flavor. After seasoning lay the chicken on foil wrap, enough to cover completely, wrap tightly and put aside in your refrigerator. Let chicken rest in foil for 1 to 1-1/2 hours. With your charcoals ashed white transport your dish to the grill, ensure that the chicken is low enough so that the lid of the barbecue will close tightly. Fill the bottom pan half full with water which will help keep the chicken from drying out as well as capture any errant dripping. Position the chicken over the pan below. Shake additional seasoning in areas that might have fallen off in transport. Close the grill. *Note if you have an uneven grill surface place the pie pan directly on top of the grill. Place the can on the pie pan and slip the chicken over the can. With this method no bottom pan is required. Ensure that grill lid will close completely. Test Temperature with a meat thermometer. 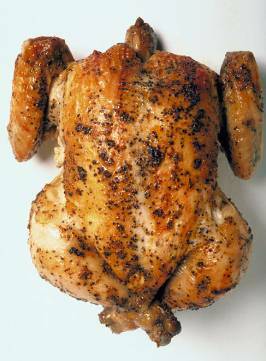 All chicken should cook to a temperature of 180 degrees in the breast and thighs of the chicken. If at the right temperature remove from the barbecue and transport the chicken in doors and let stand for 3-5 minutes. Remove the chicken gently from the can remember the liquid inside will be hot. One thing that bears repeating is cleanliness. It cannot be overstated in regards to ensuring that areas touched or in contact with raw chicken are properly cleaned to prevent transfer of salmonella virus. The best ways I've found to manage this process is to use a spray cleaner and a solution of bleach and water mixed together. First, the chicken is properly washed down using only water to remove any particles lodged in the chicken. This is the perfect opportunity to remove any excess fat. Fat is not necessary and can be trimmed especially around the openings of the chicken. Wash the chicken again if you've used a knife to remove the fat. The utensils used to remove fat should be collected in one single place for cleaning. Remove any other dishes or container before washing down the chicken. Place the chicken in the sink and wash thoroughly. Remove the chicken placing it on a dish or tray separate from your dishes. I would shake off any excess water into the sink. You can pat the chicken dry with a paper towel if desired. After the chicken has been patted dry spray down your sink with water. Follow that with a 50/50 mixture of water and bleach in a spray bottle if you have the bottle. Spray the entire sink area. Wait 5 minutes then create a mixture of soap an water in your sink. Use this to wash down your utensils. For restaurants Health Departments require a three part sink process. First they want a 50/50 mix of water and dish detergent. Next you follow with a standing clear water rinse. Lastly you will disinfect the tools with a 1 cap full of bleach about 1 Oz to a 1 gallon solution on water. The tools are then removed and left to air dry. Follow this process and you'll always ensure that you and your guests are safe from any food related illness. *Listed above are total cooking times; these are estimates depending on amount of heat.